Some years ago, just the Saturday before a Monza Grand Prix, my wife and I had been invited by an old friend of mine, Nestore Morosini from “Corriere della Sera”, at “L’assassino”, a restaurant in Milan; most of the people attending the dinner were sports writers, radio and TV commentators. We sat in the middle of a long rectangular table among them. A pretty, good-looking young woman was sitting just opposite me and was introduced to me as Lucia Ranza, an architect. The conversation went on pleasantly but focused on the following day racing, obviously, led by experts. In such a high-level conversation I was rather a careful listener, more intent on learning than on taking part in. By the middle of the dinner, someone suggested to continue the evening somewhere else, so I was forced to say: “We have to go home soon otherwise the dachshund will wreck everything”. At that moment, Lucia put on the alert, her eyes became brighter and her smile friendly: “Do you have a dachshund! ?”, she said. Unwillingly, I had uncovered a magic pot full of feelings, anecdotes, frailties and sincere affectivity. Just for a twist of fate, I discovered that Lucia, the woman opposite me, not only was fond of dachshunds but, together with her sister, she also breeds them passionately and successfully. All three of us started to rattle on, unawares we were spinning out a never-ending task. At first our talking intrigued our table companions, but when it became faster and faster, they came back to their favourite topic, leaving us secluded in a sort of virtual, lively, soap bubble. To be quite honest, we didn’t notice the reasonable secluded we ended in, we didn’t mind about it and kept on singing dachshunds’ praises. 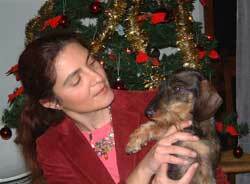 Nowadays, Lucia is a dear friend of ours, everything started that very evening, a sort of “D-Day” to me, when I could benefit from her uncommon versatility and deep affection she puts in breeding dachshunds. 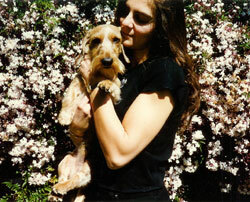 I dare say Lucia considers breeding dachshunds a sort of “mission”, not only she breeds, feeds and sales dachshunds, all-in-price, she also leads a breeding in which dreams are grown and sold because of her knowledge for satisfying the need of tenderness anyone feels. Love and tenderness are a remarkable “surprise pack” everyone gets in going out of her breeding with a red dachshund. Really, she gently offers you a “piggy bank” brimful with emotions that only who knows and appreciates dachshunds can understand. Her enthusiasm is infectious, I own up to be largely infected: in fact, now I am member of the Amici Bassotto Club, the specific club recognized by the E.N.C.I. and the F.C.I., and I am happy to get the “B come Bassotto” magazine. Thanks a lot, Lucia, for your willingness and for having fed my dreams! Now, at a distance of time, I want to apologize to the people who were attending that dinner: you thought of us as selfish, odd people, perhaps, impolite. I am sure you shall excuse us only if you fell in love with a dachshund. First try and then trust!